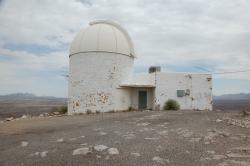 New Mexico State University runs Apache Point Observatory which operates four telescopes but also owns a 24 inch reflector on Tortugus Mountain. This telescope has been used for planetary observations and observations of the Comet Shoemaker-Levy 9 and its impact on Jupiter. This is a very interesting story of the history and renovation of the 24 Inch telescope and Tortugas Observatory.